Fishing sinkers are weights used to force a lure or bait to increase its sink rate, anchoring ability, and casting distance in fishing or fishing by net, and they can make the bait and fishing net reaching the ideal position. Actually, fishing sinkers are made by lead all the time; however, lead will cause pollution to the environment and be harm to people’s health. 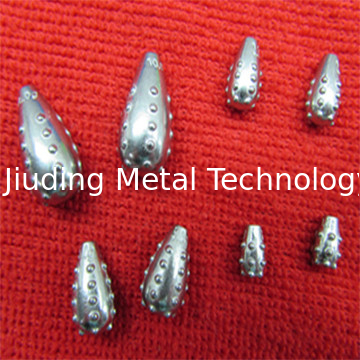 In recent years, increasingly attention has been paid to environment protection both in international and domestic, tungsten alloy fishing sinker has replaced lead weight gradually with its features of high density, small volume and environmental-friendly. With many years of tungsten heavy alloy manufacturing experience, more than one hundred sets of fishing weight manufacturing moulds, advance manufacturing technique, Guangxi Chentian offers various kinds of tungsten alloy fishing sinkers products for clients, and we are able to customize tungsten fishing sinker which can be used in all kinds of environment as per client's requirement. In all, we are one-stop shop for all your tungsten fishing sinker.